Yesterday Third Man maintained that England cricketers were dominant even after their set backs at Perth because their minds were stronger than those of the Australians. Today, the mind of the captain of Australia fractured into smithereens before the eyes of the cricketing world, its pieces splintering into a thousand fragments each shard available to be used against him. 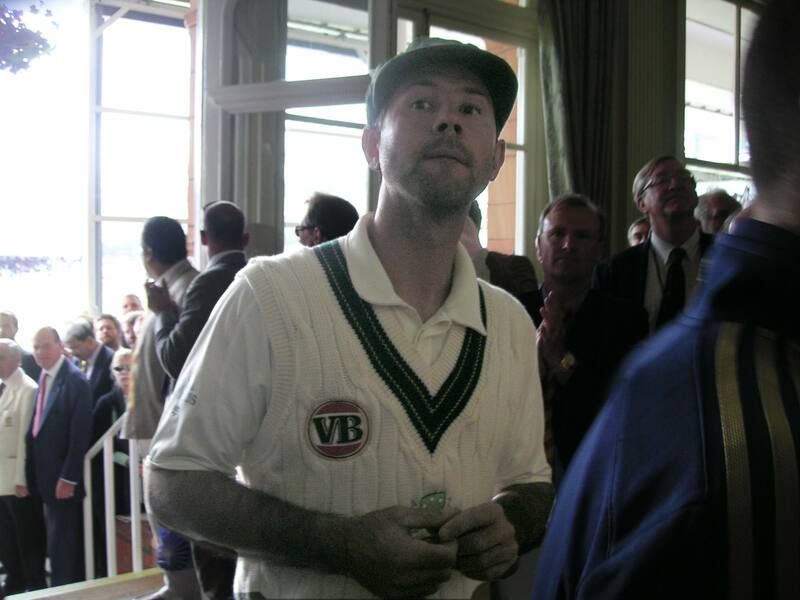 Cricket is cruel – just how cruel Ponting is about to discover. Defeat no longer takes place solely on the field, if indeed it ever did. Today defeat takes place in the virtual field that connects us all. The Punter’s rant (because it was a decisive gamble and one too many) against the umpires was a declaration not of strength but of impotence. His thinking, confused and racing under the pressures that accelerate time, locked onto and magnified the importance of the unimportant – the cardinal error in decision making. Institutions also think, so, shortly afterwards the feeble mind of Cricket Australia, in the person of their Chief Executive, was on show in all its mental confusion as it elevated the importance of unity and ignored the importance of a total apology for its captain’s error of judgement. Cricket needed immediate contrition and a promise that Cricket Australia would take action independently of the match officials as well as accepting any decision that they might make. Instead cricket got the wrong kind of spin. Meanwhile Jonathan Trott was giving everyone a lesson in excluding the unimportant from consideration. For five and half hours or more he gave that which might only distract his concentration on the ‘now’ no head space whatsoever. With training, thought and practice he has construct a technique founded on the firmest of bases, mentally and actually. From this solid base he performs each element that makes up a precisely timed shot. But this kind of excursion from the crease is brought to an end when he decides – yes, when he decides that it is time to get back to the importance of the present. The path of the excursion he takes is trodden by a series of well defined and ritual actions that lead him unvaryingly back to ‘now’. By this route to the present he wins for himself freedom from both the past and the future. It is the liberty to play correctly from his carefully chosen and practiced palette of strokes. So what if these tend by a ratio of 2:1 to favour the leg side. He is not out 141. It is a joy to watch and a lesson in stripping out the unimportant – in seeing the wood for the trees. A Mexican wave can mean that the batting is dull, but when the home crowd gets out the beach balls while their team is in the field you know that they have surrendered. This photograph must be plastered across the England dressing room by tomorrow morning. 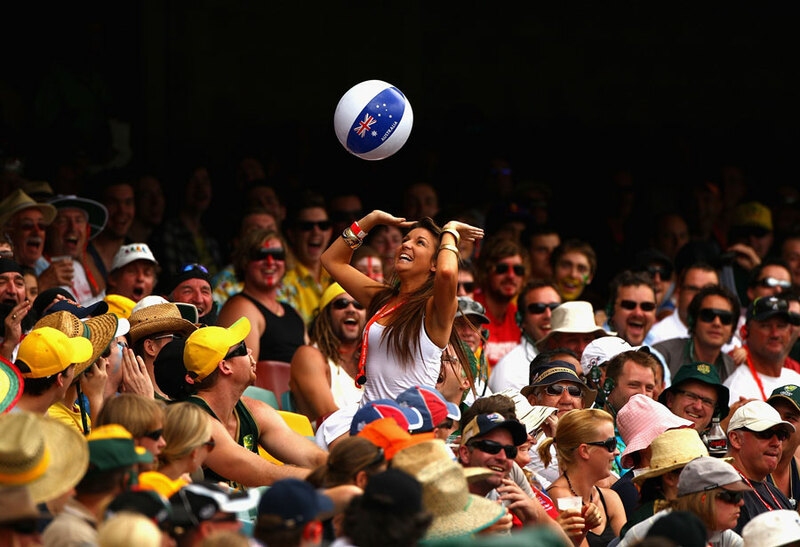 A few beach balls patted into the Aussie dressing room would not go amiss either. England lost the chance to win this Test (which they should have won) in the first innings. Tooting Trumpet, over at 99.94, tells us that Andy Flower was away from the dressing room on that fateful first day. Flower really is that important to England’s ability to become Lords of Time, and to improve thinking, plan well and truly believe. His influence is inestimable in the battle to dominate time just as he was when batting himself – thinking, planning and executing those wonderful run chases. Australia must be made to endure another fruitless day in the field. They must be made to know the full extent of their impotence. Their selectors must be placed in the dilemma of having to decide whether or not to continue with this toothless bowling and beleaguered batsmen. In short they must be panicked into change or panicked into stasis. England’s bowlers should be given a day in the shade to learn what it feels like to be in a side where the batsmen dominate the opposition. The batsmen must feel what it is like to score big and to treat the opposition as their net bowlers. Simpson, both Chappells, AB, Taylor, Ponting did this to England when at a similar advantage. Now it is England’s turn. It doesn’t come often – the winter must be relished. The night before Flintoff had down loaded a ten minute talk on Arthur Schopenhauer from Philosophy Bites. With stuff like this going on in his head he cared not that his knee was the size of a beach ball and that playing that day risked doing such irrepairable damage that he would never be able to play again. As others have found, Schopenauer banishes pain ten times better than the anti-inflammatory injections and painkillers he’d had back at the team hotel. Flintoff had never before been so excited about a day’s cricket in a life already filled with intense cricketing emotions. “This guy ‘Shop ‘n drop’ is powerful stuff,” he confided to Anderson in the corner they shared in the dressing room. “No, man, he’s dropped the essence of Kant,” expatiated the Burnley boy. Today Flintoff had had a good haircut at a favourite barber’s shop around the corner and was going to blow the remaining Australian batsmen away with this new mental technique. “Straussy, don’t you dare take me off. I know I’ve got the capacity for aesthetic experience today. I can feel it. I just know it.” “What ever,” mumbled the England Captain, winding some tape on a finger bruised when taking a questionable catch the day before. “Freddie, you’re a work of art, that’s what you are,” said Peitersen revealing in afrikaans an unsuprisingly deep understanding of the German philosopher’s ideas. “A right piss artist,” said the rest of England team, in unison, revealing much else. The rest is history. 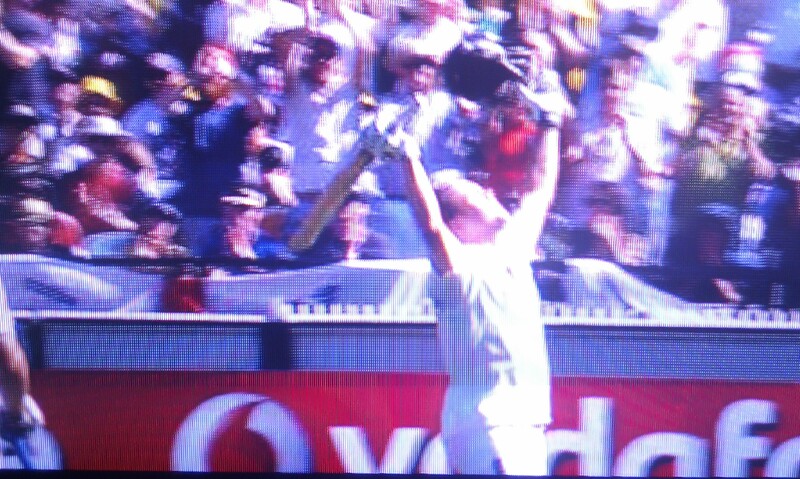 Haddin knicked off to Collingwood at second slip on the fourth ball of Flintoff’s first over that morning. The great cricketer stood Christ-like as his fellows mobbed him. “You’re effing there Freddie,” said Alastair Nathan Cook, his hand drawn instinctively to the bowler’s heart. A silent Flintoff nodded firmly and deliberately in agreement. He was there, the pure subject of will-less knowing on the very spot where Richards and Lloyd had had their aesthetic experiences in World Cup Finals, where Bradman and Hammond had got there in Tests, where Lillee and Massey had become transcendently will-less on a muggy day in ‘72. Where Grace and Sobers … so many others had found the thing in itself in a simple field that had once been part of the Eyre family’s estate at the edge of St John’s Wood village. “Your’re effing there Freddie,” said Alastair Nathan Cook, his hand reaching instinctively to the bowler's great heart. Clarke did not delay them long. Dancing Feet came down the track to Swann, found himself yorked and quit the field at the end of another of the great Lord’s innings. Hauritz, mesmerised by the intense stare in Flintoff’s eyes, left a ball that the bowler had already seen would jag back and crash into the off stump, leaving it leaning sideways like a crocked tooth. By now the roar around Lord’s was deafening to all but Flintoff who heard only the inner quiet of the aesthetic experience, the one hand clapping of the noumenon from where he could not sense his body demanding release from this torture. The three cortisone injections from a few days before were inadequate to prevent the disintegration of his knee. A cry went up, but was not heard. With four wickets to his name, his body refused to take him back to his mark, those hard yards ahead of him. Will-less, Flintoff, turned there and then, eight paces from the bowling crease. If he could go no further, he would bowl from here, where he stood. If this was to be his last ball it would be ‘the’ ball. Starting wide, angling in, and surfing time as the day before he had surfed his team mates, Flintoff foresaw the ideal delivery force itself through the batsman’s feeble guard to crash into the centre stump as if he was once more that boy playing in a Preston street. 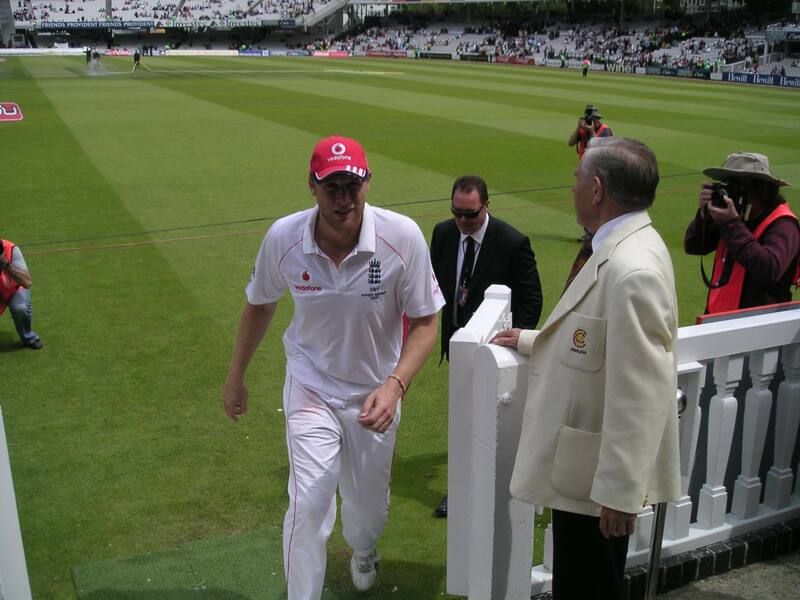 The photograph, left, shows Flintoff for the last time as a player leaving the Eyre’s field, Thomas Lord and James Dark’s great enterprise. In the Long Room the Australian Captain’s expression is like none seen before. Boyish. Puckish. What does he have in his hand? Who is he trying to catch sight of? Compassion, says Schopenhauer, arises from the penetration of the illusory perception of individuality, so that one can empathize with the suffering of another. In this way compassion serves as a clue to the possibility of going beyond desire and the will. 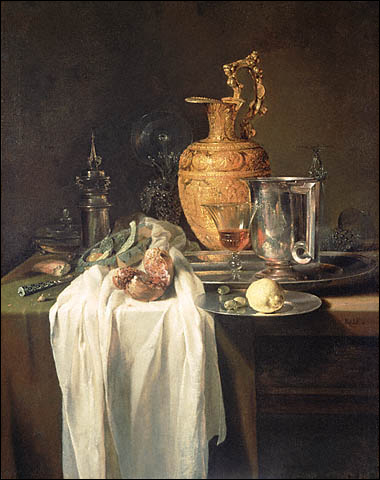 In a painting such as Willem Kalf’s Ewer, Vessels and Pomegranate (above), Arthur Schopenhauer believed an artist could communicate the aesthetic experience to others through the beauty to be seen in ordinary everyday objects. The parallel Third Man hopes to have made should need no further explanation. 27 overs 4 maidens 5 wickets for 92 runs. 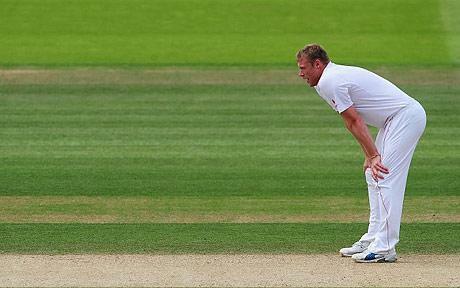 Andrew Flintoff’s first 5 wicket haul at The ‘Home of Cricket’ and only his third in a career spanning 79 Test matches. Then why was that 5fer in his last innings at Lord’s inevitable? He willed it so. It was the second Test of the series. In the first, England, against the odds, had hung on to the worst end of a draw. In their first innings at Lord’s, thanks to a mighty 161 from Andrew Strauss they had clocked up a solid 425 – a par score from which the game could take each of its four possible courses. Classic cricket. Led by Anderson and Onions, with four and three wickets each, England bowled out Australia for 215 and established a grip on the Australian throat. Tightening that grip, Strauss chose not to enforce the follow on and at 4.35 an over each England batsman played his part in taking the lead to 524. Could Australia match England’s defensive spirit from the first Test? Could Australia rise to the record breaking challenge and on a good wicket execute a morale destroying coup de grace? At 356 – 6, on the final morning, with Michael ‘Dancing Feet’ Clarke 136 not out and Johnson connecting well, for the faint of heart history looked in the making. Yes, yes and then came Flintoff. But Third Man has taken things too far too quickly. He must reverse the trusty Time Machine 24 hours to the start of the fourth day’s play on Sunday morning the 19th July. Juddering into the new present (time travel can be nausiating), he finds good company on the top deck of the Pavilion where the ‘live’ question is whether England will declare their second innings at their over night score of 311 with Flintoff not out 30 and Broad not out 0, or will they make Australia field again. Third Man’s companion says that he is going down to the Long Room to watch the players take the field. In years of slipping in and out of Dark’s, he had never done this before, believing that players deserve their privacy walking to and from the field. 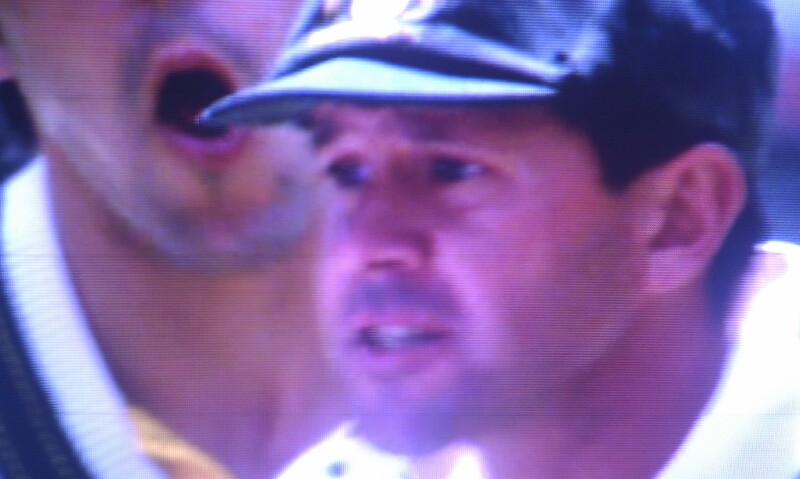 He had once unintentionally passed a hot, sweating and devastated Graham Gooch on the stairs, had see in his eyes the mental exhaustion as the adrenalin that had sustained him left him to the mercy of the deepest fatigue. It had seemed an unforgiveable intrusion just to be walking down stairs in an ‘ordinary walking down stairs way’ when here was the helmeted Ajax returning to within the Walls of Illium after an hour’s battle with Akram. He remembers, too, Rod Marsh and a member having a serious set too on the concourse in front of the Committee Room window during a long and tedious break for rain. “Mr Marsh, I take great exception to that!” had screamed the member. “You can take what you f**king like, mate,” had replied the Antipodean. But this is a special occasion and TM so wants to see Flintoff in what he thinks will be the Preston boy’s last Test, so hobbled does he seem from injury upon injury and reliant on pain killing injections to silence the warning pain as more and more irreparable damage is being done. TM skips down the southern stairs in a stream of excited members making for the Long Room, but he chooses to stand alone on the bottom rung on the first landing outside the England dressing room. One by one the players emerge, led by Strauss. He counts ten of them chatting to each other and going about their business as if it was any other day. But no Flintoff. Then, out he comes. As silent as the dead. Staring into the middle distance in a trance of concentration, summoning from somewhere within him the power of the will to win. He is set apart, physically and mentally. He alone can and will win this match. He alone has the mental strength to return to his mark time and time again, turn and run in … no matter what the situation, no matter where the game is, no matter what had happened to the previous ball. AN EXTRA: later that day the Australian captain asked for barriers to be erected to allow his players through the Long Room unmolested and from somewhere in the banqueting suite Mr Bradshaw and his stewards found polished silver posts and a bright blue silk rope. Behind these oddly refined pain barriers, Ponting and his batsmen, one by one, showered in cruel invective, a particularly English mixture of venom and sarcasm, would make their way through that room to the double doors, into the searing light and the vivid green of the field of play. Graeme Swann is an old fashioned off-spinner. His action as illustrated in the stills above produces lots of rotations on the ball giving a high probability of turn. This allows him to aim the ball to pitch wide of the off-stump with the intention of letting any resulting turn challenge the inside edge of the right hander’s bat as this film of a Swann delivery to Ponting illustrates. But this film also reveals a slight ‘wobble’ on the ball as it spins slightly out of the line of its axis. Amercian quarter-backs reckon that this wobble helps their throwing accuracy. In cricket it also provides the bowler with random variations that affect the degree of resulting turn. Depending on how much of the wobbling seam makes contact with the pitch, the ball’s sideways movement can range from the prodigious of the sharply turning delivery to the minimal of the ‘arm ball’ that skids onwards along the line of the incoming ball this time to challenge the outside of the right-hander’s bat. Wobble also randomly affects the direction and extent of any drift, dip and bounce. Midwicket is positioned on a line with the bowler’s crease and a few pitch widths across from the wicket to stop any pressure relieving single. The scoring option is a cover drive but this must be played against the rotations of the fast spinning ball. This is what Ponting attempts but fails to achieve in the YouTube clip. These physical and tactical skills have taken Swann over a dozen years to hone – years exploring a lost art – a Search for Lost Time – as can be followed on these two further clips. In this winter’s Ashes series, Swann and England have tried to add the threat of a ‘Special Ball’ which moves away from the right hander because of the different direction of rotations to his normal ball. Whether the England spinner has this delivery at Brisbane and, if he has, when he decides to use it will be the subject of bluff and counter bluff that makes Watson’s mental assault on Finn look as crude and thuggish as it is. Swann and England’s psychological assault on the Australian batsmen, begun months ago with carefully leaked and indiscrete remarks about a ‘dousra’, is worthy of a John le Carre novel.